Air travel is zero rated for VAT and pays no fuel duty. All these points are backed by mainstream research – read more in our Briefings and Information section. How many people are flying every year, worldwide? IATA says the US has the most originating international air passengers with UK, Germany, Spain and France next. It says international passengers worldwide were 952 million in 2009 and domestic passengers were 1.5 billion in 2009. IATA said (Feb 2011) they want to ” handle 16 billion passengers and 400 million tonnes of freight” by 2050. There are around 800 million air passengers annually in Europe. And around 222 million in the UK (2011 figure, excluding transit). IATA said (June 2012 link that in 2011, aviation transported some 2.8 billion passengers (and 48 million tons of cargo). See also World Bank data on the number of air passengers, country by country, 2002 – 2010. How much carbon does the global aviation industry emit? IATA says the airline industry emitted 669 million tonnes CO2 in 2012. [674 million tonnes in 2013 – up 2.6% on 2012]. IATA says 649 million tonnes CO2 in 2010 (compared with 627million tonnes in 2009). (529 million tonnes in 2004, about 630 m in 2005 and 679 m in 2006). About a 10 – 11% increase in CO2 emissions between 2005 and 2010. 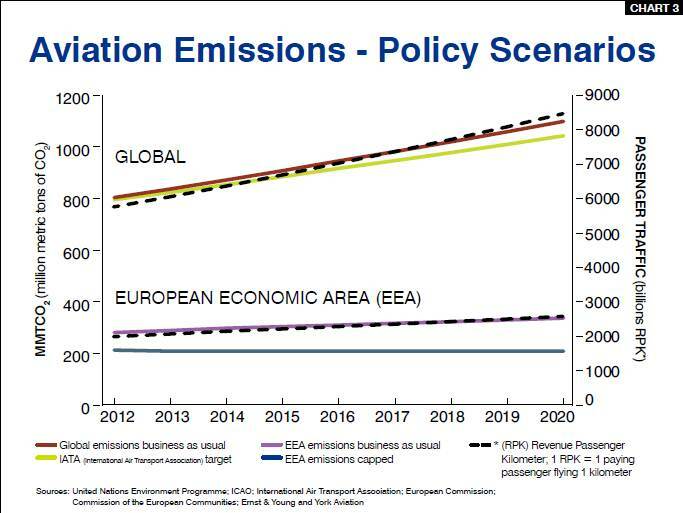 IATA says: “Total climate change impact (including radiative forcing from other greenhouse gases) is 3%, and projected to grow to 5% by 2050 (IPCC)”. ATAG said (? for 2011) : “If aviation were a country, it would rank 19th in the world in terms of gross domestic product (GDP), generating $539 billion of GDP per year, considerably larger than some members of the G20 (and around the same size as Switzerland). 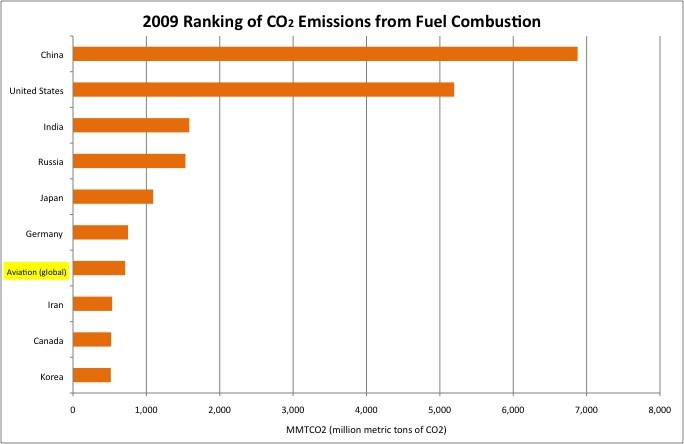 [Compared to its position as the 7th largest CO2 emitter – see below]. Worldwide, flights produced 770 million tonnes of CO2 in 2015. [Figure for international aviation, not including domestic, was 492,000 tonnes in 2013]. The aviation industry consumes around 1.5 billion barrels of Jet-A1 fuel annually. Aviation is responsible for 12% of carbon emissions from all transport sources, compared to 74% from road transport. If aviation were a country, it would rank 21st in the world in terms of gross domestic product (GDP), generating $664 billion of GDP per year (in 2015), (around the same size as Switzerland). 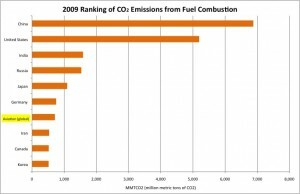 If aviation were a country, it would rank about 13th in the world, in terms of its carbon emissions. That is about the same (in 2013) as Saudi Arabia. In 2011 it was 676 million tonnes. Then 770 million tonnes in 2015. That’s 18.6% higher in 2015 than in 2010. And 14% higher carbon emissions in 2015 than in 2011, in that time global aviation went from equivalent to the 19th biggest country by GDP to being the 21st biggest. How much jet fuel is burned each year by the global aviation industry? So presuming 7 barrels of oil in a ton, and aviation is using some 1.7 billion barrels of kerosene per year, that is around 11.9 or 12 billion tons. A barrel of crude oil is about 42 US gallons and depending on the grade of oil, can make about 19 US gallons of gasoline, 10 gallons of diesel, 4 gallons of jet fuel [ie. that is 9.5% of the barrel that can be made into jet kerosene] and another 9 gallons of other oil products such as liquid petroleum gas, plastics, lubricants or heating oil. So it takes about 10 barrels of crude oil to produce one barrel of jet fuel. [Analysts project that aviation biofuels may replace roughly 1% of kerosene by 2015, 25% by 2025, and 30% by 2030. The CCC expects biofuel may replace 10% of UK jet fuel by 2050. So if the industry just got 5% of its current fuel demand from biofuel, that would require 3.5 billion gallons per year. Wikipedia says in 2010 world biofuel production – all biofuels, not only biodiesel – was 28 billion gallons US, of which 82% was bioethanol, of no use in aircraft. Only about 5 billion gallons of biodiesel were produced worldwide in 2010, much of it from palm oil. http://en.wikipedia.org/wiki/Biofuel The 28 billion gallons provided 2.7% of the world’s fuels for road transport ]. Jet A Fuel produces about 9.57 kg CO2 / gallon of fuel burned. Which is about 2.5 kg CO2 per litre. [If the global aviation industry produced 649 million tonnes of CO2 in 2010 – see above – this equates to around 70 billion gallons, as 649m / 9.57 = approx 68 billion]. How do global aviation emissions compare with emissions by large countries? It comes 7th. Aviation emissions, worldwide (2009) were 7th compared to whole countries, after China, USA, India, Russia, Japan and Germany. Then global aviation. How many commercial planes are there in the world? What proportion of UK citizens fly in any one year? In 2014 the DfT’s “Public experiences of and attitudes towards air travel. 2014″ said: “Just under half (48%) of adults surveyed had flown at least once in the last 12 months and 10% had made 4 or more flights.” Outward and return flights and any transfers were counted as one trip. either within the United Kingdom or to go abroad. Short-haul flights to Europe were the most common; 37% of adults had taken a short-haul flight during the last 12 months, 18% had taken a long-haul flight and 7% had flown within the UK. Frequency of flying increases with income and socio-economic group. Among respondents in managerial and professional occupations, 71% had made at least one flight in the last 12 months compared with 50% of those in intermediate or routine and 36% in manual occupations. 2.5 Respondents living in London or the South East were also more likely to have travelled by plane than people in the rest of the country. Over half (57%) of people in London and the South East had made at least one flight and 23% had made three or more in the last 12 months compared to 44% and 11% respectively in the rest of the country. People living in London and the South East were also more likely to have made a long-haul flight (29%) than people in the rest of Great Britain (14%) but had a similar propensity to fly within the UK. A quarter of those who had not flown at all in the previous year said they expected to make more trips in the next year. Among those who had made three or more flights in the previous year, 14% anticipated making more flights and 20% anticipated making fewer flights in the coming year. Respondents who expected to make more flights were asked why they believed this would be the case. The most common reason, cited by half of those that expected to make more flights, was because they wanted to go abroad more. Other reasons included changes in personal circumstances (20%) and having friends/relatives who had moved abroad (10%). How many seat kilometres do UK airlines fly each year? The increase in seat kilometres used – by UK airlines – between 1991 and 2011 was 153%. The increase was 22% between 2001 and 2011. What proportion of UK airport passengers are flying for business reason, compared to holidays or visiting friends and family? In 2010, the proportion of business passengers (as compared to leisure, including visiting friends and family) was 29.9% at Heathrow, 20.4% at Gatwick, 29.5% at Manchester, 19.6% at Luton and 17.7% at Stansted. Data from the Health Protection Agency shows the proportion of business passengers has been falling steadily since 2000. [Seat km used divided by number of passengers uplifted – so an average figure]. British Airways averaged 3,518 km per passenger (on average) in 2011 but 3,394 km in 2005. EasyJet averaged 1,136 km per passenger in 2011 but 954 km in 2005. [Virgin Atlantic (almost no increase) averaged 7,197 km per passenger in 2011 and 7,146 km in 2005]. Thomson Airways averaged 2.983 km per passenger in 2011 but 2,447 km by Thomson Fly in 2005. Thomas Cook averaged 3,440 km per passenger in 2011 but 2,907 km in 2005. BMI averaged 1,391 km per passenger in 2011 but 910 in 2005. Which airlines have the largest number of annual revenue passenger kilometres (RPK)? This puts Delta Airlines top, with over 300 billion passenger kilometres in 2011. Which are the largest airports in the world? What is ICAO doing so far to cut global aviation emissions? What their phrase “carbon neutral growth” from 2020 means is only that airlines can offset emissions above 2020 levels starting in 2021. No need to actually cut emissions. The proposal by IATA, the aviation industry, is even weaker than the ICAO resolution, and allows emissions to continue to grow. Above: the emissions-reductions proposal of the International Air Transport Association IATA) (green), and business-as-usual emissions (red-brown). Figures below from the 2001 National Noise Study carried out by the Building Research Establishment (BRE) for DEFRA – the most comprehensive study of recent years. Individual planes have become considerably quieter since the 1970s but this has been off-set by the huge growth in aircraft numbers – causing more noise in total. Planes are becoming slighly less noisy (a better term than “quieter”) but the changes are small. Most people cannot distinguish a difference in volume between sounds less than 3 decibels apart. The 2003 Aviation White Paper admited that, if growth continues at the present rate, the noise problems will become worse. The ‘silent plane’ still remains no more than a gleam in the researcher’s eye. The noise from aircraft is measured by airports, and by government, in an unsatisfactory manner. It is averaged out over a period of hours, giving an average number that is of limited value. If an airport is open for, say, 16 hours during the day, the average may be over 16 hours. This has the effect that, back in the days when Concorde (which was phenomenally noisy) you could get the same average noise over an hour from just one Concorde and on other planes, as with perhaps 20 of the modern planes, which are signifanantly quieter. However, people on the ground may find the continuous noise from planes going overhead every few minutes more annoying. For most people, the noise nuisance depends both on the intensity of the sound, as well as the number of noise events. The Government believes that “significant community annoyance” from noise only starts at around 57 decibels. However, other studies show that annoyance starts much below this. The ANASE study found that significant annoyance began at a lower level, but this study was shelved several years back, and has not been used – possibly in part as its findings were inconvenient. The Government is aware both that the method of measuring aircraft noise, and the degree of annoyance it causes, are matters of great concern to many people, and they are attempting to find some solutions. But it will not be quick. What legal controls are there on aircraft noise in the UK? By contrast, car horns cannot be sounded in residential areas after 11.30pm, by law; ice cream vans cannot sound their chimes before 12 noon or after 7pm; noisy fireworks cannot be set off by unauthorised persons between 11pm and 7am; and if your local council has resolved to apply the provisions of the Noise Act 1996 (in England, Wales or Northern Ireland), it must take reasonable steps to investigate complaints of noise from dwellings or licensed premises between 11pm and 7am. Have planes actually become quieter in the past few years, and are A380s quieter than 747s? The type of engine is also important. And Heathrow said: “Heathrow has played a key role in enabling local residents to share in the reductions in aircraft noise that the A380 delivers. Following input from key airlines operating at Heathrow, the A380 was specifically designed to meet one of the quietest noise categories. Because airlines value the ability to operate at Heathrow during the day and night, and Heathrow’s standards are directly driving the development of quieter aircraft. If you have complaints about noise, or of planes away from set flight paths, you can complain to your local airport management (check who is the appropriate manager to write to). Aviation already accounts for about 13% of the UK’s greenhouse gas emissions. That is about 6.5% of the actual carbon dioxide emitted, though that is somewhat underestimated, as it does not take account of the carbon on return flights to the UK. The present rapid growth of air travel, if allowed to continue unchecked, would mean the UK would find it almost impossible to meet its 2050 target for reducing emissions by 80%. The aviation industry routinely claims aviation emits about 2% of global carbon emissions. This is not the full story. As planes fly at altitude, they also cause formation of cirrus cloud in the upper atmosphere, which affects the climate – though the science is complicated and the precise extent of the problem is not known. The effect of the cirrus cloud, and the NOx and other gases emitted, and their interactions in the atmosphere, means the effect of aviation emissions on the climate are around double those of just the CO2 itself. Aviation emissions will be capped for the year 2012 at 97% of the sector’s emissions over the period 2004-2006 (212 million tonnes of CO2). Between 2013 and 2020, the cap will be set at 95% of aviation’s 2004-6 emissions. Air travel is increasing rapidly. Even in the developed countries like the UK, the industry would like to double by perhaps 2030 or 2040. Elsewhere in the newly expanding economies, air travel is growing by 4% or more per year. And the global industry plans to keep to a rate of growth of this order of magnitude. To get the liquid fuels the industry will need, as Peak Oil begins to make its mark, the industry is desperately searching for alternative fuels, from either biofuels or from other sources, such as from coal. Without these sources it can neither grow at the rate it would like. The industry hopes, unrealistically, that biofuels will enable it to keep its carbon emissions down. See Climate Change Briefings & Information for more more detail. Air pollution is a major issue for those who live in the vicinity of large airports. EU legal limits came into place in 2010 but that they are being breached, especially round Heathrow. The Environmental Audit Committee published a pretty damning report earlier in November 2011. Details. It may also be that limits are being breached around London City Airport. Emissions from aircraft, air-side support vehicles and airport related traffic all contribute to a build up of potentially harmful gases such as oxides of nitrogen, carbon monoxide, VOCs (volatile organic compounds) and ozone. They also produce small particulates. The most important pollutants are usually nitrogen dioxide (NO2) and small particulates (PM10, PM2.5). These often breach standards set by the UK government and the EU to protect human health. In June 2010 – after the closure of UK airports for 5 days in April 2010, which was an ideal opportunity to assess the impact of the airports when they were functioning – a report was published by researchers at Kings College, London,, showing the effects round Heathrow and Gatwick. The story, from the Aviation Environment Federation (AEF) is at http://www.aef.org.uk/?p=1072 and the 4 page report is at short report (pdf). “How and airport can damage a local community” gives a personal perspective. Stop Stansted Expansion produced a response, presented to Uttlesford District Council in August 2006, about the very severe impacts which the airport’s operations were already having on the community and on the lives of the people who live there, as a result of growth at the airport. It describes stress, anxiety, noise pollution, light pollution, traffic problems and breakdown in community life. The Government’s estimate of aviation’s contribution to the economy is based on a report largely paid for by the aviation industry. The report, The Contribution of Aviation to the UK Economy was carried out by consultants Oxford Economic Forecasting in 1999 with an update in 2006. • The report ignored the tax-breaks the industry receives through tax-free fuel and being zero-rated for VAT – worth around £9 billion a year. • Nor did it factor into its calculations the huge cost aviation imposes on society and the environment, which are estimated to be around £16 billion a year. • Independent experts argue that the report over-estimates the number of jobs aviation expansion would create. There is a “tourism deficit” to the UK economy – estimated at around £ 13 – 20 billion per year over the past decade. This is the difference in spending (other than on travel tickets*) between money spent by visitors to the UK, and the money spent by Brits travelling abroad. Every year, a great deal more money is spent by UK residents travelling abroad, than by foreign visitors coming here. The component of the tourism deficit from trips made by air travel is a large part of it. For instance, in 2010 the air travel component was £12.4 billion our of a total tourism deficit (including ship and Channel Tunnel) of £14.2 billion. In 2011, the air travel component was £11.2 billion, out of the total of £13.1 billion. Below are recent Tourism Deficit figures from the ONS, from their Overseas Travel and Tourism reports. In 2010 about £12.4 billion. In 2011 about £11.2 billion. (Taking the figure in Table 4.1 from the figure in Table 5.1 of the ONS Travel Trends at Travel Trends 2010 or for other years). † point of earliest revision due to the most recent quarterly benchmarking. The deficit to the UK associated with spending on overseas travel and tourism grew from £13.7 billion (2011) to £13.8 billion (2012). During 2012, overseas residents made an estimated 31.1 million visits to the UK, this is 1% higher than in 2011. …. Earnings from visits to the UK in 2012 year to date were £18.7 billion, 4% higher than in 2011. During 2012 year to date, UK residents made an estimated 56.6 million visits abroad, unchanged from 2011. … UK residents have spent £32.6 billion on visits abroad in 2012, an increase of 3% from 2011. [Taking £18.7 billion away from £32.6 billion comes to £13.9 billion, so approximately the same as the £13.8 billion]. The headline number, i.e. the total tourism deficit in 2011, was £13.1bn or £13.0bn if business travel is excluded. [But the ONS 2012 report said the 2011 deficit was £13.7 billion]. However, this includes trips by sea/tunnel/road and the amount spent by air travellers alone is not available in the quarterly figures. You have to wait for the annual ONS publication ‘Travel Trends’, in July each year, for that breakdown. You can however work out an estimate which should be reasonably accurate by using the average inbound and outbound spend per head figures and then applying a percentage uplift for air travellers, based on the historic pattern ( which is around 85%). Using that method, an estimate is that the deficit on air travel in 2011 was £11.2bn, compared to £12.4bn in 2010. * Earnings and Expenditure They exclude payments for air, sea and rail travel to and from the UK. For any traveller on an inclusive tour an estimate of the return fare is deducted from the total tour price. The figures from ‘Travel Trends’ only reflect spending during the trip. They exclude expenditure on air fares and this gives rise to a further deficit which was £2.2bn in 2008, £2.0bn in 2009 and £2.6 bn in 2010. These deficits arise from purchases of air tickets from foreign airlines by UK residents (= imports) minus purchases of air tickets from UK airlines by foreign residents (= exports) and can be found in Table 3.2 of the ONS (Office for National Statistics) Pink Book, The Balance of Payments, under air transport services. Combining the two sets of inputs, the 2008 air travel deficit was £19.6bn; 2009 was £15.3bn and 2010 was £15.0bn. ONS publish 4th quarter travel and tourism data for each year in April (known as the MQ6 data release) and this enables last year’s deficit to be calculated (but ONS usually revise the MQ6 figures slightly when they publish Travel Trends later in the year). This shows the deficits in other sectors are much smaller, with the only sector giving a deficit as large as travel being electronic equipment. The aviation industry routinely claims it creates huge numbers of jobs for the UK economy. In practice, most low price airlines make every effort they can to reduce the number of employees (automatic check in, automatic baggage systems etc) and the number of jobs created per extra million passengers is not high, and has reduced over the years. According to the OEF (Oxford Economic Forecasting – not part of Oxford University) report “The Economic Contribution of the Aviation Industry in the UK” (OEF) published in 2006, http://www.oef.com/Free/pdfs/Aviation2006Final.pdf the number of direct jobs in the aviation sector in 2004 was 186,000 (full time equivalents) at a time that there were 215m terminal passengers. Using figures supplied by the Airport Operators Association, OEF found that the aviation industry directly employed 186,000 people (full time equivalents) in 2004. British Airways and Ryanair are of course two very different types of airlines but this is nevertheless an indication of the way the industry has changed. And Ryanair now handles more than twice as many passengers as British Airways. Oxera also say between 1995 – 2008 GVA (gross value added) by the aviation sector grew 8.3% and was was £8.8 billion in 2007. And that between 1995 – 2008 aviation passengers grew 81% while air freight grew 33%. However the number of jobs provided over this time seems to have declined, not risen. There were 180,000 direct aviation jobs in 1998 and 141,000 in 2009 – a reduction of 27%. During the period of 1998 to 2009 there was a rise in passenger numbers of 37%. Aviation jobs do not keep pace with growth in passenger numbers. The number of direct aviation staff per million passengers was (back of an envelope maths from the above figures) 1,133 in 1998 [180,000 / 158,818,000] ; in 2009 it was 646 staff per million passengers. [ 141,000 / 218,126,000]. business sector is almost in balance. In 2010, foreign businesses made 4.9m business trips to the UK by air (spending £3.6bn) compared to 5.2m overseas business trips by air by UK business (spending £3.8bn). the countries visited by providing them with foreign currency earnings, jobs and investment. impact of the UK deficit on international air travel could be up to 430,000 UK jobs. example, the North of England has a ratio of 4.7 outward tourists for every overseas visitor. As a result, these are the areas whose local economies and jobs’ markets would have most to gain if a better balance could be achieved between outward, inward and domestic tourism. The rates of APD change on 1st April 2012, when the rates rise by around 8% – in line with inflation, taking into account the fact there was no rise in 2011.The tax take is likely to be around £2.5 billion, rather than £2 billion per year after the rise. That means the net benefit to the industry of its exemption from VAT and fuel duty will be around £8.5 billion, after April 2012. The Treasury has reiterated that APD is not an environmental tax. It was instituted in order to – in a small way – compensate for the aviation industry’s non-payment of fuel duty and VAT. • Motorists pay 58p a litre duty on their fuel. Airlines pay nil. • Motorists pay a further 22p VAT on their fuel. Airlines pay nil. • Motorists pay 20% VAT to have their car serviced. Airlines pay nil. • Motorists pay 20% VAT to buy their car. Airlines pay no tax on new aircraft. So as they pay no duty and no VAT, there is Air Passenger Duty instead. This tax is charged at only £12 per passenger for any short haul flight (under 2,000 miles) departing from a UK airport. Not on return trips. £12 on a holiday trip to anywhere in Europe does not seem a lot. The price of one or two main course in a restaurant? or 3 or 4 cups of coffee? The 2003 Aviation White Paper set out the Government’s aviation policy until 2030. It expected to see a near trebling in the number of passengers using UK airports. To cater for this, it argued that the country would require up to 5 new runways, plus “full use” made of the existing runways at virtually the airports in the country. If this went ahead, it would be the biggest single programme of airport expansion this country has ever seen. In its ‘Progress Report’ on its White Paper, published in December, the Government confirmed the key policies set out in 2003. After the Government decision not to go ahead with a 3rd runway at Heathrow, or a 2nd runway at Stansted (no new runway is permitted legally at Gatwick until 2019) the heart of the 2003 White Paper was removed. The Coalition Government is adamant that there will be no new runways in the south east. They have also expressly said they are not contemplating a Thames Estuary airport. They are, however, keen to see aviation growing, within environmental constraints – rather than aviation growth at any cost. And they are keen to see growth at UK regional airports. As the 2003 White Paper no longer holds together as a policy, the UK currently has no effective aviation or airports policy. In some circumstances, councils and airports, and even the Courts, still use the White Paper, in the absence of anything more current. The Scoping Document framed the debate and asked a series of questions to initiate a dialogue with a wide range of stakeholders on the future direction of aviation policy. Then in March 2012 the DfT will consult on their “sustainable aviation framework for UK ” which ends in July 2012. Then in March 2013 the DfT will adopt its sustainable aviation framework – which will be the new aviation policy. Government policies on climate change and their attitude towards aviation expansion remain contradictory. The government published forecasts for passenger demand in Nov 2007. The forecasts were for the UK as a whole and for the big London airports. They revised the previous demand forecasts (published in 2000) and the CO2 forecasts published in 2004. The figures anticipate passenger numbers in the UK rising from 228 million in 2005, to 270 million in 2010, to 325 million in 2015, 480 million in 2030 and around 580 million in 2050. The DfT’s Central estimate (there is also a higher and a lower one) is for 345 million air passengers per year by 2030, compared to 211 million in 2010. (The low estimate for 2030 is 305 million and the high estimate is 400 million). The future forecasts are for passenger numbers to grow to between 380 – 515 million by 2050. That is between 1.5 – 2.3% annual growth, which is less than the previous 3.7% expected growth from the Air Transport White Paper of 2003. In the hope of getting the Heathrow 3rd runway through, Geoff Hoon, the then Transport Minister, in January 2009 made undertakings in Parliament that the UK would guarantee that its aviation CO2 emissions were no higher in 2050 than they were in 2005. This is a less strict target that that for the rest of the UK, which has under the Climate Change Act to cut its carbon emissions by 80% on 1990 levels by 2050. The Department for Transport made its reponse to the CCC report in August 2011 – delayed several months. However, as the consultation on the aviation Scoping Document was currently underway, it was unclear how definitive the DfT response could be. 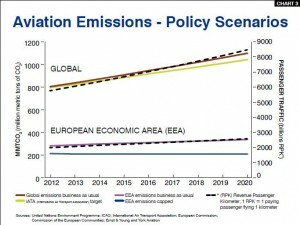 Future aviation policy will need to be in line with the requirements of the carbon targets. “Jan 2012: On Question Time Green Party Leader Caroline Lucas alleged that the aviation industry in the UK is being subsidised in the form of fuel tax and VAT exemptions by some £10 billion. What is the evidence for this figure? The claim appears in a Green Party report and briefing in 2003. Both documents cite a 2003 report entitled “The Hidden Cost of Flying” by Brendon Sewill, an environmental campaigner. In the report, Mr Sewill calculates that implementing fuel tax at the same rate as private fuel tax would cost the aviation industry £5.7 billion, adding VAT to the cost of tickets would add £4.0 billion to the cost, and the abolition of duty free would cost £0.4 billion. Deducting the contribution that air passenger duty (APD, worth £0.9 billion, which would no longer be necessary) makes to the Treasury, he calculates that the eocnomy could potentially be missing out on a contribution of £9.2 billion per year. Since both reports were produced, the aviation industry has expanded significantly and VAT has risen to 20 per cent. Both could have had an impact upon the figures. However, Volterra calculates the average cost of a ticket to be £136, with 182 million passengers according to the Civil Aviation Authority. At a VAT rate of 20 per cent added to the cost of the ticket and assuming the same number of passengers, this would raise £4.95 billion. Added to the older figure for fuel tax, this amounts to a tax exemption of £10.65 billion. It is worth noting however that these analyses assume that the addition of new taxes to airline tickets would not have an impact upon the demand to fly. Whether or not this is the case in reality might depend upon the extent to which airlines passed on these new costs to the customers, however theInstitute for Fiscal Studies has noted in the past that changes to VAT do have an impact upon levels of cunsumer demand. However that the figure has been used by government is seemingly confirmed by a Department for Transport response to the 2007 consultation on the Aviation Emissions Cost Assessment. The Transport Committee report also highlights some difficulties associated with describing these examptions as subsidies (and indeed it notes that, unlike rail and bus travel, “airports and airlines receive virtually no subsidy.”). In fact these perks are better described as tax breaks (i.e. money that isn’t collected by HMRC, rather than public funds made available to the industry). To complicate matters further, there are a number of historical and legal precedents for the aviation industry’s tax exemptions. For example, the 1947Convention on International Civil Aviation specifies that aeroplanes should be exempt from fuel duties, while in the UK all forms of passenger transport arezero-rated for VAT. So while the £10 billion figure has been widely used – both in government and by others – to describe the savings that the aviation industry enjoys as a result of its VAT and fuel duty exemption, questions have been raised about the details. Government itself hasn’t provided the specifics behind itsz use of the estimate, while the breakdowns we have seen from Volterra and Brendon Sewill are now slightly dated. Brendon Sewill has been in touch with us to point out that the Treasury responded to the Select Committee’s request for more information. According to their response, the figure of £10 billion is rounded and calculated from a 2008 Office for National Statistics figure on the amount spent on air travel (£13 billion), combined with Department of Energy and Climate Change figures on air fuel consumption (16 billion litres of fuel). They give rounded figures for the potential tax of £2 billion (VAT) and £8.5 billion (fuel duty) respectively. Full Fact has found updated DECC figures for fuel usage which state that during 2010, 11.2 million tonnes of fuel were used in the aviation industry. Jet A fuel has a density of roughly 0.82kg/l, suggesting that 13.62 billion litres were used. The figure is likely to be lower than in 2008 due to the effects of the economic downturn and improvements in aircraft efficiency. If fuel duty were applied in the same way as for unleaded petrol (currently 0.5795 £/litre, although due to be raised to 0.6097 £/litre in August) this would raise £7.89 billion. The ONS has also released updated figures for consumer spending, showing that in 2010 £12.4 billion was spent on air travel. Applying the current VAT rate of 20 per cent, this would raise £2.48 billion. Added together, if VAT and fuel duty were applied to the aviation industry, this would raise £10.37 billion. More up to date figures on the amount raised by APD here. Carbon offsetting for your flight – does it work? AirportWatch is not convinced that offsetting schemes are effective. With more people buying carbon offsets to try and compensate for the carbon dioxide produced from their flights, the effectiveness and justification for these offsets is increasingly being questioned. The Observer article discusses the problems.The Observer – Carbon offsetting Ripoff? If you can’t make your mind up about offsetting, have a look at the Cheatneutral website. As it helpfully says: “What is Cheat Offsetting? The aviation industry’s advertising ……….. The industry is very good at telling part of the truth, and using adverts to put their message across. There are the BAA adverts showing maps of the world covered in the words Opportunities and Customers emblazoned across the whole world, showing Customers in large letters across Siberia and the Sahara. And many more. The airports are working hard to cut their ground emissions, installing wind turbines, recycing paper, cutting down on energy used for lighting etc. All very laudable and excellent. But at the same time aiming to increase flights by as much as possible, negating the savings made. So …sadly … greenwash. The ads by IATA below take some beating though. IATA (the International Air Transport Association) has produced a series of adverts, which appear in in-flight magazines and in other media. The aim is to tell people how green flying is, how the aviation industry is trying very hard to reduce emissions, and how flying really is wonderful. Their solutions to the carbon emissions problem range from reducing the number of ice cubes on board planes, blaming cows, flying in straight lines, to keeping the planes clean. • Most cheap flights are actually taken by the better off – and they are not likely to be the ones who live under flight paths and near the busy feeder roads. • ‘Choice’ can be deceptive. Often the real reason for ‘choosing’ the plane is because ‘everyone else does’, or because we’re unaware of alternatives. • It would be physically impossible for the whole world to fly as much as the UK currently does. Yet climate change will hurt the part of the world whose people fly the least. There is a real question of justice here. For some thought-provoking opinions on “love miles” (the air journeys taken to visit friends or relatives abroad) see Tahmina Anam’s piece in Guardian Comment – and the many, many comments it generated. Closed 20th October 2011. This is the first part of a consultation exercise to produce a new UK aviation policy, to be published in March 2013, after a second consultation in 2012. The Scoping Document consultation was a general one, to frame the future policy. Its questions are quite vague. It also asks responses to be evidence-based. AirportWatch therefore produced a range of supporting documents. These can be seen at Scoping Documents – evidence papers The responses from AirportWatch, and many other organisations are also available on that page.